First Choice Blinds Conservatory Pleated Blinds are purpose built for conservatory windows and roofs. 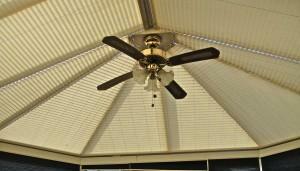 They not only provide the neatest fit, but often offer the best value for money for all shapes of conservatory. They are handcrafted to individual specifications to suit all shapes and angles. 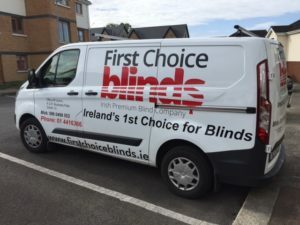 First Choice Blinds conservatory blinds are custom-made to your windows, doors and conservatory roof and can be tailored for all shapes and sizes. Different finishes such as Sheer, Black Out and Plain. 5 different colour rail options available. Various different treatments including a solar reflective backing (the blind can reflect heat and light from the sun to help keep the conservatory cool in the summer whilst retaining heat in the chillier months). 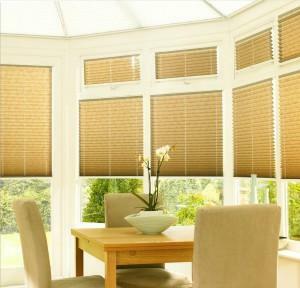 First Choice Blinds pleated blinds are tailor made for Conservatories. 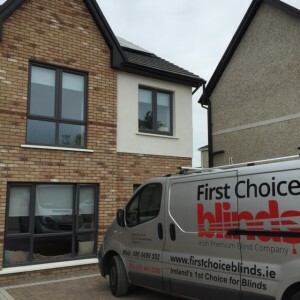 First Choice Blinds pleated blinds are fitted into the recess of the window and are very discreet. They fold away out of view creating no obstruction in the windows. Our Conservatory Blinds give you privacy, keep the room cool in summer and warm in winter and eliminate glare, making your conservatory the most popular room in your home. Fitted – the blind is attached to the window and operated with a ‘tab’ handle – because of its neatness, this is a very popular method. Free Hanging – the blinds can be free hanging, cord operated, covering a number of glass panels with one blind. Motorised Free Hang – similar to the cord operated blind, but fitted with a ‘Somfy‘ motor in each blind and operated with a remote control, giving ease of use from anywhere in the house. All our shaped blinds have “integrated fabric control” to ensure the blinds hold their shape closed or open. The concertina effect of the pleated blind allows it to almost disappear when it is not in use. All our blinds, rectangles and shapes use solar reflective fabrics to eliminate glare, reduce heat gain and heat loss. Our made-to-measure, bespoke Conservatory blinds will allow you to use the room in the heat of the summer and the long cold winter. They are ideal for finishing off your conservatory. Tallaght,Terenure,Walkinstown,Perrystown,Dundrum,Blessington,Ballinteer,Ballyboden,Blackrock,Churchtown,Crumlin,Donnybrook,Dun Laoghaire,Firhouse,Foxrock,Goatstown,Jobstown,Kilmacud,Killiney,Kimmage,Knocklyon,Leopardstown,Lucan,Milltown,Ranelagh,Rathcoole,Rathmines,Rialto,Saggart,Sallynoggin,Sandymount,Stillorgan,Covering all of Dublin based in Ballymount.